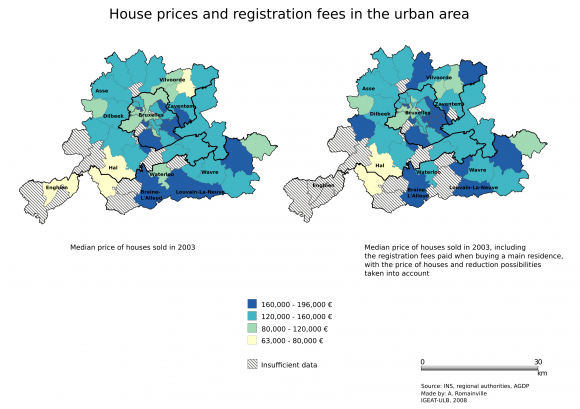 Who benefits from home ownership support policies in Brussels? À qui profitent les politiques d’aide à l’acquisition de logements à Bruxelles ? Wie is gebaat bij de beleidsmaatregelen die de aankoop van de gezinswoning in Brussel ondersteunen? The ownership support policies implemented by the Brussels Region are intended for certain categories of household and target certain neighbourhoods in the centre of the first ring. Via the different measures which have been established, the Region channels private investment towards certain working-class neighbourhoods to which it would like to attract private developers and a more well-to-do population. The analysis shows that the tools intended for “middle-income” households are used mainly in the central neighbourhoods, in particular along the canal, whereas the measures intended for the most disadvantaged households cause migrations from the central areas towards the western part of the Region. Ownership support has enabled a significant improvement in the situation of many households, but until now has only been relatively successful. Locally, the population movements it causes may, however, have a considerable social impact, all the more so since part of the targeted neighbourhoods have already experienced gentrification phenomena and high rent increases. Les politiques de soutien à la propriété mises en place par la Région bruxelloise s’adressent à certaines catégories de ménages et ciblent certains quartiers du centre et de la première couronne. A travers les différentes mesures mises en place, la Région canalise l’investissement privé vers certains quartiers populaires qu’elle aimerait voir réinvestis, à la fois par les promoteurs privés et par une population à revenus plus élevés. L’analyse montre que les outils qui s’adressent aux « revenus moyens » sont principalement utilisés dans les quartiers centraux, et en particulier le long du canal, tandis que les mesures qui s’adressent aux ménages les plus pauvres provoquent plutôt des migrations depuis les espaces centraux vers l’ouest de la Région. Ces aides à la propriété ont permis, pour beaucoup de ménages, une nette amélioration de leur situation, mais elles n’ont connu jusqu’à présent qu’un succès tout relatif. Localement, les mouvements de population qu’elles provoquent peuvent cependant avoir des effets sociaux considérables, et ce d’autant plus qu’une partie des quartiers ciblés connaissent déjà des phénomènes de gentrification et de fortes hausses des loyers. Het beleid dat het Brussels Gewest voert om de aankoop van de gezinswoning te steunen, is bestemd voor bepaalde categorieën van gezinnen en voor bepaalde wijken van het centrum en de eerste kroon. Met de verschillende steunmaatregelen kanaliseert het Gewest privé-investeringen naar bepaalde volkswijken die het aantrekkelijker wil maken voor particuliere projectontwikkelaars en een bevolking met een hoger inkomen. Volgens de analyse worden de instrumenten die bestemd zijn voor gezinnen met een middelgroot inkomen, hoofdzakelijk gebruikt in de centrumwijken, in het bijzonder langs het kanaal, terwijl de steunmaatregelen voor de armste gezinnen veeleer leiden tot migraties vanuit de centrumwijken naar het westen van het Gewest. De steunmaatregelen hebben ervoor gezorgd dat de situatie van veel gezinnen verbeterd is, maar tot nu toe hadden ze een vrij beperkt succes. Op lokaal vlak kunnen de migraties waartoe ze leiden, evenwel aanzienlijke sociale gevolgen hebben, te meer daar een deel van de wijken in kwestie al te maken heeft met gentrificatie en forse huurprijsstijgingen. 1In Belgium, where the proportion of home-owning households is one of the highest in Europe, a large part of the housing policy has been devoted – since the beginning – to promoting access to private ownership (see Noël, 2009). In most western countries, ownership support policies have been adopted at key moments in urban history, for either economic (use of the construction sector as a tool for economic regulation, encouragement of household consumption) or more ideological reasons (maintaining social order) (Harvey, 1974; Butler and Noisette, 1977; Kesteloot, 1986). Access to private ownership is also encouraged by unstable prices on the real estate market – households seek to protect themselves from future rises in rent and ensure a certain financial security through home ownership. 3Influencing the housing market is a priority for the Brussels government, which has to face this intolerable situation generated by twenty years of rent and purchase price increases, in which access to decent and affordable housing has become a problem for a very large part of the Region’s population. In order to have decent housing, many households have no choice but to dedicate more than half of their income to their rent, thus reducing other vital budget items. 4Today, the housing policy represents close to 6% of regional expenditure overall. Since 1989, approximately 40% of this budget has gone towards the maintenance and rental of a stock of 38 000 social housing units, which has become exceedingly insufficient today (with some 33 000 households on waiting lists); the rest is earmarked essentially for ownership support and urban renewal policies (see Zimmer, 2006). 5In addition to responding to a housing crisis of an unprecedented scale, the regional housing policy has also been designed to contribute to reinforcing the residential appeal of Brussels. This targets middle- and high-income households in particular, which explains why a significant portion of the property support scheme measures are intended for them today. The housing policy must also participate in the vast project to “revitalise” central and vulnerable neighbourhoods, which, as we shall see, justifies a concentration of interventions in the most disadvantaged areas of Brussels. 6In this article, we examine the main regional interventions intended to promote access to private ownership. Based on the hypothesis that the intervention of the public authorities in the area of the housing market is likely to have a strong influence on the evolution of the neighbourhoods concerned and therefore on the residential geography of the city, our aim, on the one hand, was to make an inventory and a critical analysis of the objectives of these policies, and on the other hand, to review them after several years of operation and consider their impact on the central neighbourhoods and, in particular, on access to the housing market for the most disadvantaged populations. 7The text begins with a presentation of the different types of intervention on behalf of the Region as regards the private housing market and the form of assistance granted for each of these (investment, number of housing units produced/number of households which receive support). This is followed by results of an analysis conducted2 regarding the beneficiaries (with data provided by the competent regional institutions), in order to answer two questions: Who are the beneficiaries of these policies? What is their impact on the neighbourhoods concerned? A critical discussion then follows on the subject of regional housing policies, in terms of their objectives and results. 8There are two forms of regional intervention3 in the property support scheme: the production of new housing and support for the purchase and renovation of existing housing. 9In Brussels, the production of housing at government-regulated prices is carried out on the one hand via BRDA (Brussels Regional Development Agency) – a public corporation – and on the other via “neighbourhood contracts” – targeted intensive “revitalisation” programmes. The means preferred by the Region for the production of medium sized dwellings is the promotion of private investment in neighbourhoods which are usually neglected by investors. This mission is therefore carried out systematically through public-private partnerships (PPPs), which are generally aimed at attracting private investors to invest in projects by guaranteeing them sufficient profitability via a grant. Thanks to public intervention, the selling price of housing produced is significantly lower than the market prices. 10The production of housing via BRDA is the most costly tool in terms of the number of housing units produced (table 1): it involves major construction or renovation works, producing comfortable housing sold below the market price, and moreover, via a financial arrangement guaranteeing a certain profitability for the private partner. Reports from the firms Archi+i, Deloitte&Touche and Aries, information provided by AATL. The average investment iscalculated based on the first two series (conservative assessment); realisations based on the first three series. 11In the framework of neighbourhood contracts, only 110 subsidised housing units have been built to date. Although the established system allows private partners to purchase land for a quarter of its market value, investors have shown little interest so far. a tax deduction, or “allowance”, when buying a first home. mortgage loans at rates lower than those offered by banks (Fonds du Logement – the housing fund). renovation subsidies, which do not constitute direct support for the purchase of a home, but are incentives which are not insignificant given the state of the housing stock in Brussels. 13These three tools are very different in terms of impact and the public concerned. The tax allowance is the tool which costs the Region the most (table 2), representing an enormous loss of revenue for public funds. Its impact is very difficult to measure as no information regarding the beneficiaries is gathered, and above all because the effect may be very limited since the sellers very likely integrate the allowance – at least partly – in their calculation of the selling price. The impact is also reduced by the strong increase in real estate prices. * Information provided by the office of the minister Vanhengel. ** Activity reports and data provided by the housing fund. 14The housing fund loans really make it possible for (relatively) disadvantaged households to purchase their own homes. The regional grant corresponds to the difference between the interest rate of the loan which the housing fund obtains on the capital market and the reduced interest rate offered to households. With 600 loans per year on average, it is able to cope with an increasing demand, but its effectiveness is greatly reduced by the increase in house prices, which forces borrowers to increase their personal contribution (€20 000 on average). 4 The regulation which came into effect in 2008 should remove some of these obstacles. 16For the Brussels Region, the public housing policy must reinforce access to housing as well as contribute to the residential appeal of Brussels and the “revitalisation” of neighbourhoods. 17Residential appeal is the number one priority of the Regional Development Plan adopted in 2002. The objective of the policies to promote the city’s appeal is to attract or to keep middle-class households in the city, as their presence is felt to be crucial in order to “encourage social equilibrium”, fight against the concentration of poverty in the city, contribute to the renovation of buildings and put right the regional finances through their income tax contributions. Several tools are therefore aimed specifically at “middle-class housing”; although the terms used may vary, the target profile generally includes “middle-class (and higher) households”, and in particular, young households seeking to settle down and purchase a family home. 18In order to participate in “urban renewal”, the ownership support policies must also comply with a political will to ensure a greater social mix (in the working-class neighbourhoods). An area of action was defined for these different policies, based on socioeconomic, housing quality and living environment criteria. 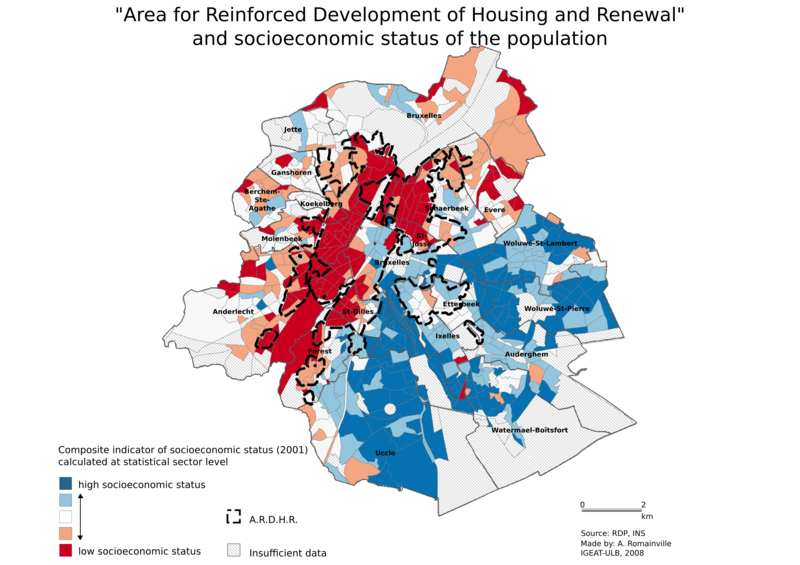 This “area for reinforced development of housing and renewal” (EDRLR) gradually concentrated most of the means implemented by the Region in the area of housing and renovation, in a decision motivated by the will to encourage renovation in the most derelict neighbourhoods and to ensure greater social mix. It corresponds to the most disadvantaged neighbourhoods in the Region (figure 1). 19All of the middle-class housing created by the Region are therefore located in this area; support for the purchase and renovation of housing is greatest there, and the eligibility criteria are relaxed. 20Different criteria may be used to limit access to support and to keep it for a section of the population, such as, for example, the refusal of applicants who are already home owners or who exceed a certain level of income. These conditions vary from one tool to the other: for example, for the purchase of a subsidised housing unit, it may be considered acceptable to a certain extent that you are already a home owner; you may benefit from a tax allowance or a renovation subsidy regardless of your level of income. 21The fact that the housing policy has several objectives makes it difficult to come up with a precise definition of a target public, all the more so since terms such as “social mix”, “average income” and “middle-class housing” leave room for interpretation; this vagueness is very noticeable if one reads the many parliamentary debates on the subject; the conditions for access to regional support, and in particular the income ceilings, have already been the subject of various adaptations and long political debates. For example, the income ceiling in order to be eligible for renovation subsidies has been revised several times: it was first lowered to “reinforce the social character” of the subsidies, which, for the first seven years, had mainly benefited home owners in well-off neighbourhoods for their “luxury” projects (Becker et al., 1989); afterwards, they were raised once again in order to meet the social mix objective. 5 Taxable income per year. 22The “maximum income” which determines access to support is now relatively high, considering the income of the inhabitants of Brussels: when there is a limit, it is between €30 000 and €55 000,5 which is at least twice as high as the median income6 of the population. The access to support is therefore very wide – which is not surprising for a programme which targets “middle-income” households, given that almost half of Brussels households already meet the income conditions for social housing (Noël, 2003). Although in principle families are targeted first, people who live alone have the best access to home ownership support: almost 90% of Brussels one-person households meet these income conditions. 8 Between €18 500 and €30 000 depending on the source and the year. 23The majority of BRDA housing units are bought by people who live alone (55%) and by couples without children (28%). As BRDA essentially produces housing for small families, there is a high level of under-occupation of these housing units. Certain types of household, whose access to the housing market is particularly difficult, are under-represented in BRDA’s public: households with children, which represent 16% of beneficiary households, and especially single-parent households (only 3.5%); workers (4%), unemployed people (7%) and pensioners (3%) are also under-represented. The median income of home buyers is consequently higher than the median income in Brussels, but it is much lower than the income ceiling.8 It has increased considerably since 2004. 24The projects which offer large housing units attract heads of household with the highest income, which means that the purchasing power of households determines ‑ even in the area of social housing – their capacity to “plan things on a grand scale” or, on the contrary, to adapt strictly to their needs. 9 €13 600 (median income) between 2000 and 2006. 25The profile of housing fund borrowers is undergoing major changes due to the fact that the criteria for access to loans were gradually broadened in order to meet the social mix objective. Households without children now represent half of the beneficiaries. At the same time, the public has become much younger, and the share of disadvantaged households is decreasing. Despite these changes, the housing fund still mostly benefits low-income households9 unable to purchase a home without its support; the great majority of these households meet criteria for access to social housing, whose shortage is therefore (very) partially offset. 10 €25 600 in 2006 (median income). 26The typical beneficiary of the renovation subsidies lives alone, is aged between 35 and 50 and has an income higher than the average inhabitant of Brussels.10 The cumbersome and lengthy procedures, and the obligation to hire a certified building contractor and to prefinance the works explains why the public concerned is rather well-to-do: since households are not equal with respect to these difficulties, these aspects result in a selection of the public. The recent increases in income ceilings also have noteworthy effects on the public concerned, whose income is increasingly higher. 11 By combining data received with tax statistics (INS) at statistical sector level. 28The housing units produced by BRDA are highly represented in the most disadvantaged areas of Brussels. Among the more large-scale projects is the reconversion of the former military hospital in Ixelles and the three blocks of flats in Rue du Curé in Forest. But the left bank of the canal appears to be preferred by BRDA, with large buildings (Quai de l’Industrie, beginning of the Chaussée de Gand, Rue Bouvier) as well as small and scattered renovation projects. 29The occupants of BRDA housing have a higher income than the inhabitants12 of the surrounding neighbourhoods (figure 2) when they live in the most disadvantaged neighbourhoods, such as Molenbeek, Anderlecht and in the Pentagon (the central part of the municipality of Brussels, delimited by the boulevards of the “small ring”); in the least disadvantaged neighbourhoods targeted by BRDA (Ixelles, Saint-Gilles, Forest) and in the more outlying municipalities (Evere, Berchem, Laeken), however, the projects benefit inhabitants whose income is lower than that of the inhabitants of the neighbourhood. 30Given the income ceilings used, depending on the location of the projects, BRDA appears to lean in the direction of a gentrification of the targeted neighbourhoods or, on the contrary, to make certain neighbourhoods accessible to a population which otherwise may not have been able to live there. 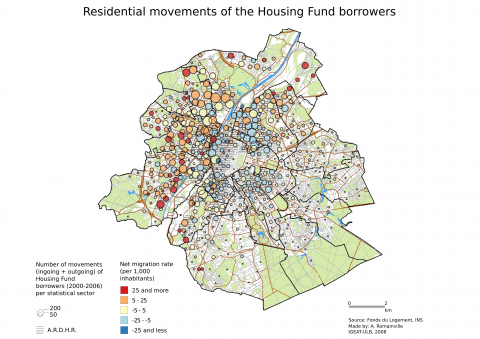 31The neighbourhoods in which the housing fund interventions are concentrated are mainly the disadvantaged neighbourhoods in Brussels with damaged buildings (figure 3), reflecting the financial situation of the households and the upper limit on the amounts lent by the housing fund. There is a particularly high number of purchases in Molenbeek, Koekelberg, Jette and Ganshoren, where real estate is more affordable. Practically everywhere, the income of housing fund borrowers is lower than that of the inhabitants13 of the neighbourhoods concerned. 32The renovation subsidies are given mainly for dwellings situated in the central neighbourhoods, where the subsidies are higher (figure 4), especially along the canal, in the western part of the Pentagon (Dansaert, Anneessens-Fontainas), around Tours & Taxis (maritime neighbourhood, Bockstael), in Schaerbeek, especially around the council house, and in east Saint-Josse. Although the subsidies provide good support for private renovation in the neighbourhoods where renovation is most needed, the terms are such that they benefit mainly the most well-to-do inhabitants: the income of beneficiaries is higher than that of the other inhabitants14 of the central neighbourhoods, whereas in the rest of the Region the income of “renovators” and other inhabitants is generally similar. 33In order to study the migratory movements of ownership support beneficiaries, we have calculated a migration rate of the beneficiaries in each statistical sector in Brussels, in relation to the population of the neighbourhood. 34The BRDA housing projects which caused a major influx of new inhabitants include the military hospital in Ixelles, the Scheut project in Anderlecht, and the projects around the canal (figure 5). The people who buy BRDA housing come from all over the Region, but especially from the western part of the Pentagon, east Molenbeek and Anderlecht. A quarter of them are from outside the Region, mainly from the outskirts of Brussels. 35The migratory pattern of housing fund borrowers is rather different: overall, they leave the most disadvantaged areas to move to the western part of the Region (figure 6). This move from east to west originates in particular in the most disadvantaged neighbourhoods of the centre: the western part of the Pentagon, east Molenbeek, Cureghem, Saint-Josse and west Schaerbeek. 36Only part of the renovation subsidies (approximately one quarter) are granted to people who are moving into a new home; the rest concerns home owners who renovate the house they live in already. It is interesting to note that the proportion of moves is not the same everywhere: in east Molenbeek, in the Pentagon and in Saint-Gilles, the majority of subsidies are often granted to “newcomers”. In other words, in these neighbourhoods where, as we have seen, the subsidies benefit households which are more well-to-do than average, public policies support the arrival of this type of household. 37With these maps we measure the importance of the eligibility criteria and the choice of targeted neighbourhoods for the support; the assessment must be detailed according to the neighbourhood, and very different impacts may be expected. 38The analysis of different tools has shown highly variable results in terms of investment and the number and type of households which receive support. BRDA brings a considerable regional investment into play, but is far from meeting a huge demand – there are approximately 10 000 applicants on the waiting list. Until present, the housing fund has been able to meet all of the demands. It is the tool which reaches the most disadvantaged public; paradoxically, it is also the only tool in the form of a loan rather than a grant. 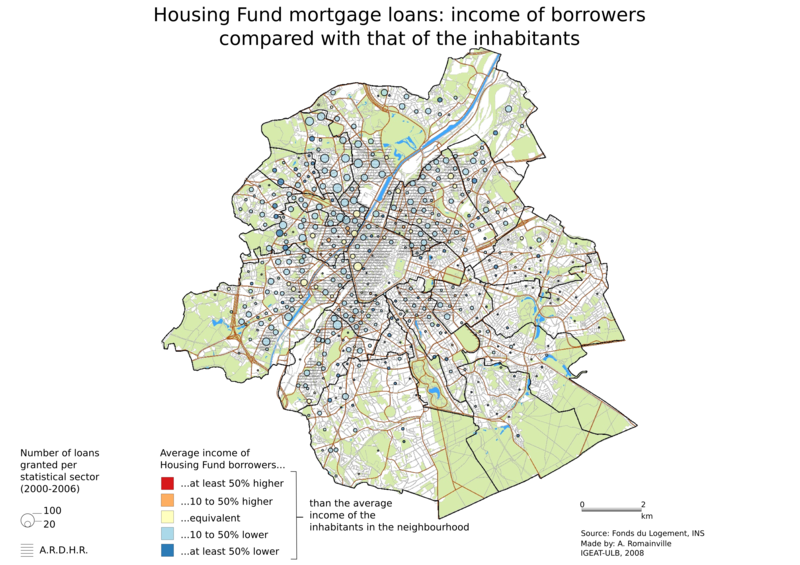 It suffers greatly from the increase in housing prices, which prompts households to purchase increasingly smaller dwellings, and the upper limits placed on the amounts of the loans make it more and more inevitable for potential home buyers to have to seek complementary financing. As regards the renovation subsidies, we know that the possibility of reducing renovation costs can be decisive for a tight budget, but the effectiveness of this tool is hindered by the complexity of the procedures. Tax deductions really puts a strain on the regional budget, and probably have a very limited effect on access to the private housing market. 39For lack of sufficient power of intervention on behalf of the public sector, the small number of operations concerned signifies above all that these tools have only a negligible effect on a housing crisis which affects a growing share of the population. With approximately 700 loans granted per year, the housing fund only represents about 5% of all residential property purchases. 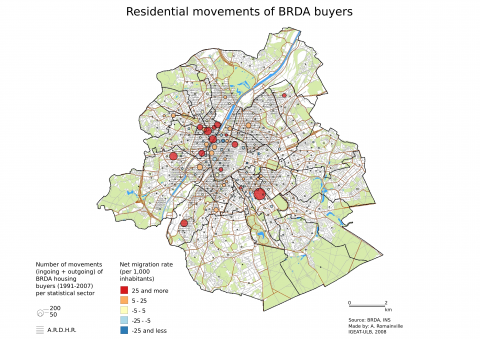 BRDA hardly reaches 1% of the market; as regards the renovation subsidies, it is an understatement to say that they cover only a small part of all renovations carried out in derelict neighbourhoods. 40Other aspects reduce the impact of certain tools: very broad eligibility criteria, which make the support accessible to households which do not need it, and the inadequacy of anti-speculation clauses. For the people who buy BRDA housing, the resale (often with a significant increase in value) and letting out of property are possible ten years after purchase. Between 1991 and 2007, 20% of BRDA housing was purchased by “buyer investors” who put them up for rent immediately, and 15% of the remaining buyers did not meet the eligibility criteria either. Such clauses are also lacking within the framework of neighbourhood contracts, which are notorious for speculation practices. Better supervision on behalf of the Region therefore seems essential in order to ensure that public aid does not lead to real estate speculation ‑ and the explosion in prices which it fosters. 41Some of the objectives which have been set for the housing policy overlap with each other. The will to attract middle- and high-income households to Brussels, for example, explains the strong political consensus which exists regarding the need for a social mix (see Van Criekingen, 2008) and the fact that this mix is demanded only in the disadvantaged neighbourhoods, whereas segregation mechanisms are most pronounced within well-to-do neighbourhoods. 42These objectives are presented by politicians as being complementary, without the necessity to establish priorities. They are however partially contradictory. The residential appeal objective, for example, leads to measures which target middle- and high-income households, which are obviously not those most affected by the housing crisis. Ownership support policies concern two distinct populations: on the one hand, households which do not have access to the private housing market in Brussels due to insufficient financial means and which have no other choice but the private rental market; and on the other hand, middle class households which move to the outskirts when they buy a home due to their requirements in terms of comfort and environment and a lack of means to buy this type of home within the Region. At first glance, the social mix objective seems to reconcile the will to target these two very different segments of the public, but in practice it leads to the definition of very broad eligibility criteria which in fact exclude some of the applicants who are truly in need of support (inasmuch as all requests cannot be met). 43Another contradiction is that the concentration of support in the central neighbourhoods partially serves the objective to promote the city’s appeal: the housing which exists in the current “target area” does not correspond very well to the expectations of families who move to the outskirts of Brussels, and who are generally growing and in search of big houses with a garden in a calm, clean and green environment – which are characteristics of the municipalities of the second ring in Brussels (see Wayens, 2006). 44With limited (financial) means of action in the Region, these contradictions clearly indicate the need for arbitration between the different objectives set for the housing policy. 45Furthermore, the relevance of these different objectives is less obvious than what politicians lead us to believe, in particular as regards residential appeal and social mix. 15 See the regional budgets or Cattoir et al., 2009. 46The need for policies to promote the city’s appeal, for example, is justified by budget mechanisms, which make regional finances highly dependent on the volume and income of the resident population through taxation. This is not, however, an inevitability; other budget options exist – including at tax level – with a better distribution of the tax burden. Furthermore, the objective to promote the city’s appeal has been repeated word for word since the first RDP (1995), although the situation has changed significantly in the meantime, with the share of income tax in the regional budget having diminished greatly (from approximately 60% to 30%15). The decrease in population experienced by the Region at the beginning of its existence has ended, gainsaying the alarmist scenarios of the past. The population has been increasing since 1995, and at least 130 000 more inhabitants are expected by 2020 (see Deboosere et al., 2009) – Brussels is far from being an empty region which needs to be populated at all costs. 47As a component of this residential appeal, the inevitable “tax attractiveness” serves to justify the enormous loss of revenue for public funds represented by the tax allowances. The creation of these allowances is in keeping with a supposed tax competition between the Regions, which is, however, very difficult to observe empirically (see Romainville, 2007): the geography of the tax burden has little influence on the choice of location of households, which, undeniably, is still determined by the characteristics of the housing market, and in particular by the geography of real estate prices. As seen in figure 7, this geography is far from being influenced drastically by the tax burden. 48The social mix objective also enjoys a remarkable consensus at political level, which contrasts surprisingly with the strong criticism it provokes in the academic world. The concept of social mix calls on a more than questionable model of integration, according to which the disadvantaged populations would “rise” socially thanks to a spatial proximity with the middle and upper classes. Furthermore, the use of this concept today suggests that bringing well-to-do households to disadvantaged neighbourhoods is enough to “produce a mix”, which remains hypothetical, to say the least. Many studies recognise the “ongoing failure of social mix strategies”; several of them have shown that spatial proximity does not translate into social proximity, and even less so into an improvement in the conditions of the most disadvantaged (see among others Epstein and Kirszbaum, 2003; Walks and Maaranen, 2008). According to Epstein and Kirszbaum, the concern about an absence of social mix in “sensitive” neighbourhoods is often “only an implicit reprobation of their ethnic specialisation”. The “pathogenic effects” of a spatial concentration of disadvantaged populations are also hypothetical; it is above all the image produced by this concentration which appears to be problematic for the defenders of social mix ‑ which explains why it is denounced so strongly when it is observed in central neighbourhoods. 49One may wonder about the necessity to establish a priority area of action as regards housing. Using eligibility criteria related to people (level of income, marital status, etc.) and/or housing (age, state of ruin, etc.) should be enough to target the people or buildings that most need public aid. As we have seen, in many cases, public aid is in fact concentrated in the targeted neighbourhoods, but does not reach the population most in need. The concentration of efforts in an area rather than on a population is emblematic of a political agenda which seems to target the aesthetic transformation of neighbourhoods and the image of the city more than the well-being of the inhabitants themselves. 50The concentration of interventions in the neighbourhoods which are already weakest from a social point of view is of concern, especially since, as we have seen, the resulting residential movements are sometimes focused strongly on certain neighbourhoods. The migrations of people who buy BRDA housing show a movement of concentration towards certain parts of the most disadvantaged areas of the city, in particular around the canal and east Molenbeek; in the framework of renovation subsidies, most of the incoming movement is concentrated more or less in the same areas. What are the effects of these “incoming flows” on the neighbourhoods concerned? These migrations are few but they may, at neighbourhood level, lead to noticeable changes. In the case of BRDA and renovation subsidies, even if the beneficiaries/home buyers have an “average” income overall (close to the Brussels’ average), they generally have a higher income than the population already living in the neighbourhoods they move to, and their arrival is very likely to cause an increase in rent prices. On the contrary, with the housing fund loans, part of the working class population leaves the central neighbourhoods to live elsewhere. 51Rent prices have gone up most in the centre and in the municipalities of the first ring in recent years (Observatoire régional de l’habitat, 2006). At the beginning of the decade, some of the neighbourhoods targeted by “revitalisation” policies experienced a form of gentrification ‑ i.e. the gradual metamorphosis of central disadvantaged neighbourhoods into well-to-do neighbourhoods, via the renovation of buildings, a change in the population and an increase in the social status of the inhabitants (see Van Criekingen and Decroly, 2003). The analysis of migrations from these areas shows an “outgoing flow” of disadvantaged populations, which indicates that in these neighbourhoods, gentrification leads to the gradual eviction of initial populations (Van Criekingen, 2006). 52In Brussels, the Region clearly channels private investment towards the areas to which it would like to attract capital and a more well-to-do population. Through grants for private investors, the renovation of public spaces, subsidies and tax allowances for home owners, regulations in the area of retail trade, etc., the public authorities structure the spread of the gentrification process. Given the number of realisations, the instruments examined here have a small impact on the phenomena already at work, but the public authorities act as a catalyst by playing the role of “guarantor” for private investment (see also Marissal, 1994; Wilson, 1989). 53The objectives set for the housing policy and the priority given to these objectives at political level are questionable, in particular the earmarking of a sizeable amount of the tight regional budget to medium sized dwelling policies based on a hypothetical “return to the city” of the middle and upper classes, whilst in the social housing sector – which is faced with an enormous and urgent demand – the Region does not manage to produce more than thirty housing units each year. 54The concept of social mix – which now legitimises a good part of the regional interventions in the area of housing – is not very convincing. The gentrification which is under way in the central neighbourhoods indicates that when there is a mix, it is only a prelude to the eviction of the most disadvantaged via the mechanisms of a completely deregulated real estate market. Furthermore, even if this eviction could be avoided, there is nothing to indicate that these disadvantaged populations would benefit in any way from this “mix”. 55Through its interventions in the private housing market, the Region channels private investment towards certain areas of the city. Its weak presence on the rental market and the absence of rent control seem to point to a will to “oversee” the gentrification under way rather than to counter the effects of eviction. 56As we have seen, however, the potential effects of regional interventions in neighbourhoods vary greatly: according to the delivery modalities, public aid benefits those who truly need it, or on the contrary, the most well-to-do fractions of the population in the targeted neighbourhoods. 57These aspects strongly challenge certain implemented urban policies; the effects of these policies must no longer be evaded. The only way to ensure that regional policies do not simply reinforce the inequitable changes in the private market is for interventions in the form of housing support to be accompanied by a strict regulation of the private market. Let us mention that the dreaded “disinvestment in the rental sector” which would likely ensue could, moreover, free up houses on the private housing market and promote access to private ownership for part of the households which are currently in the rental sector. BUTLER R. and NOISETTE P., (1977), De la cité ouvrière au grand ensemble, Maspero, Paris, 193 p.
CATTOIR P., VAESEN J., VERDONCK M., VAN DER STICHELE G. and ZIMMER, P., (2009), “Finances publiques à Bruxelles: analyse et enjeux”, Courrier Hebdomadaire du CRISP, 2007‑2008, 61 p.
DEBOOSERE P., EGGERICKX T., VAN HECKE E. et WAYENS B., (2009), “La population bruxelloise: un éclairage démographique”, in Brussels Studies, Note de synthèse No. 3 des Etats Généraux de Bruxelles, 17 mars 2009, 17 p. http://brussels.revues.org (consulted on: 25 November 2009). EPSTEIN R. and KIRSZBAUM T., (2003), “L’enjeu de la mixité sociale dans les politiques urbaines”, Regards sur l’actualité, 292, pp. 63‑73. HARVEY D., (1974), “Class-Monopoly Rent, Finance Capital and the Urban Revolution”, Regional Studies, 8, p. 239‑255. KESTELOOT C., (1986), “Les dimensions historique et structurelle de la différenciation sociale de l’espace urbain: l’exemple bruxellois”, Espace Populations Sociétés, 1, pp. 15‑30. MARISSAL P., (1994), “Rénovation urbaine et mutations sociales dans les quartiers défavorisés de Bruxelles”, Revue belge de géographie, 118, pp. 83‑92. NOËL F., (2003), “Un plan de lutte contre la crise structurelle du logement à Bruxelles”, L’année Sociale, 2003, pp. 263‑273. NOËL F., (2009), “Logements et habitat s’exposent à l’Exposition Universelle de 1958”, in: DELIGNE, C. et JAUMAIN, S. (dir. ), L’Expo 58. Un tournant dans l’histoire de Bruxelles, Le Cri, Histoire, p.145‑183. Observatoire régional de l’habitat (2006), Observatoire des loyers. Rapports réalisés par DE CONINCK S. and DE KEERSMAECKER M.-L., SLRB, Bruxelles. ROMAINVILLE A., (2007), Une géographie de la pression fiscale pesant sur les ménages dans la région urbaine bruxelloise, 17e congrès des économistes belges de langue française, Louvain-La-Neuve, novembre 2007, CIFoP, pp. 519‑538. www.ulb.ac.be/igeat (consulted on: 25 November 2009). VAN CRIEKINGEN M. and DECROLY J-M., (2003), “Revisiting the Diversity of Gentrification: Neighbourhood Renewal Processes in Brussels and Montreal”, Urban Studies, 40, pp. 2451‑2468. VAN CRIEKINGEN M., (2006), “Que deviennent les quartiers centraux à Bruxelles?”, in Brussels Studies, No. 1, 21 p. http://brussels.revues.org (consulted on: 25 November 2009). VAN CRIEKINGEN M., (2008), Meanings, Politics and Realities of Social Mix ‑ A View from Brussels, papier présenté au séminaire “Gentrification and Social Mix”, Economic and Social Research Council (UK), Bristol, 26 Septembre 2008. WALKS R.A. et MAARANEN R., (2008), “Gentrification, Social Mix, and Social Polarization: Testing the Linkages in large Canadian Cities”, Urban Geography, 29(4), pp. 293‑326. WAYENS B., (2006), “L’environnement du logement”, in Observatoire de la santé et du social, Atlas de la santé et du social de Bruxelles-Capitale 2006, Bruxelles. WILSON D., (1989), “Local state dynamics and gentrification in Indianapolis”, Indiana, Urban Geography, 10(1), pp. 19‑40. ZIMMER P., (2006), “Politique du logement en Région de Bruxelles-Capitale”, Les échos du logement, 2, pp. 4‑15. http://mrw.wallonie.be (consulted on: 25 November 2009). 1 This rate reached 27% in 1971, 31% in 1981, 40% in 1991 and 41% in 2001 (according to INS censuses). 2 “Impact des mesures régionales d'aide à l'acquisition de logements”, research carried out at IGEAT/ULB by V. Biot, S. Geczynski and A. Romainville (dir. C. Vandermotten), for the Brussels-Capital Region ‑ AATL, 2007. 3 It should be mentioned that the most important mechanisms have been implemented at federal level (in the form of tax deductions), which is not discussed in this article. Furthermore, certain regional interventions are not analysed here, either because they no longer exist (the “acquisition subsidy”, for instance), or they concern only a very limited number of housing units. 6 This is the income which divides the population into two groups: half of the population has an income higher than the median income, and the other half has an income which is lower. 7 The following analyses are based on data received from BRDA, the housing fund and AATL for renovation subsidies; no information was provided concerning the beneficiaries of tax allowances or buyers of homes produced in the framework of neighbourhood contracts. 12 Income of home buyers in 1989‑2004 (two years before the creation of the file) compared with the income in 2001 of inhabitants of the statistical sectors in which the project is located or which are nearby. 13 Income of borrowers 1998‑2004 (two years before the creation of the file) compared with that of the inhabitants in 2001. This represents the average income per declaration. 14 Income of beneficiaries in 1997‑2005 (two years before the creation of the file) compared with that of the inhabitants in 2001. * Payment appropriations listed in the regional budget and data provided by BRDA…** Section 2. As a geographer, Alice Romainville has conducted several studies at the Institut de Gestion de l’Environnement et Aménagement du Territoire (ULB), focused in particular on taxation and the housing policies in the Brussels Region. Her current research in the Department of Geography at ULB where she is an assistant, is centred on the geography of heritage and property development.